What an adventurous week we’ve had in the forest! Every day has seen groups going out to explore the wider forest and coming back with tales of amazing sites and wondrous discoveries. One group went in search of dinosaurs and they were in for a real treat. Not only did they find a genuine dinosaur egg (Robin egg), they even talked about the ancient ferns that grew along the paths. Other groups have been looking for the tadpoles that are populating the great ponds that give the woods their name. They found them, eventually, and learned about checking water depth using long sticks. They found old stone signs, with broken writing, which they then had to piece back together to understand the message written there. This group also found the number 6 on a post which was both interesting and baffling as no-one was sure what the 6 was for! There was lots of magic in the forest this week too with the making of witch’s wands. 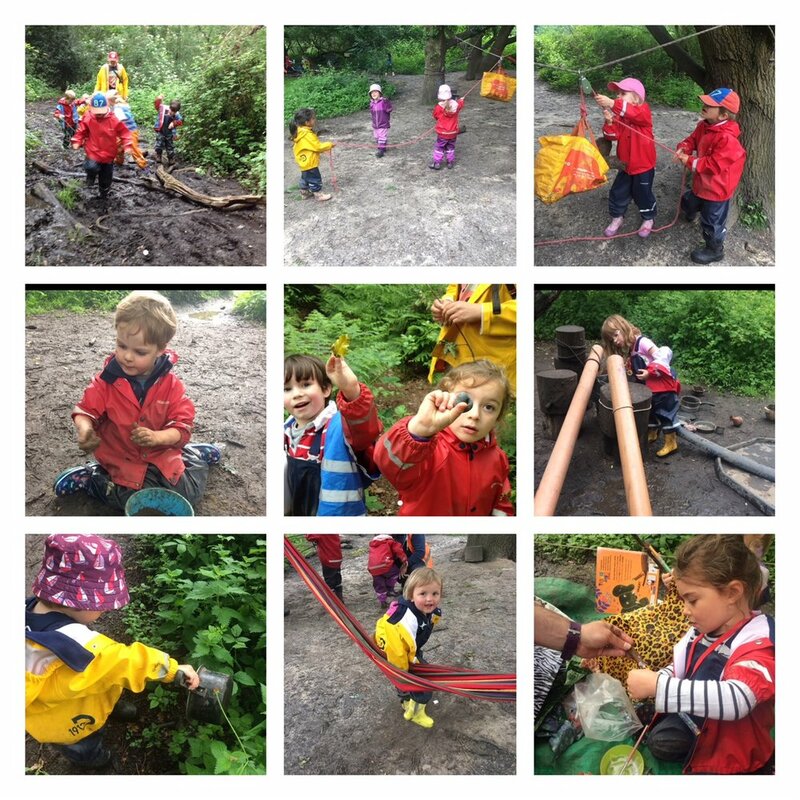 Using strips of fabric, glue and sticks, the children made their own magic wands and cast spells galore at everything and everyone in sight. Thankfully we were able to return everyone to their usual form, even if they were still a little frozen or icy around the edges! More modern magic, technology toys, have been in the forest this week with the inclusion of pulley lines and zip-lines. The pulley really interested the children with the possibilities of lifting things that were heavier than they would manage on their own and the rope to pull offered lots of opportunities for lovely collaborations between the children to test their strength against lots of different objects. The zip-line brought beaming smiles to the children’s faces as they whizzed between trees. Their patience is always impressive too, waiting for their turn before testing their strength and courage on the zip-line. We hope you have had a wonderful week too, and we look forward to seeing you all next week!